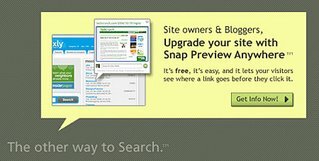 Snap offers a web service that allows you put thumbnail preview on your website, that lets people preview link page without open another window. It's easy & quick, you do not need register,just paste the Snap Preview Anywhere™ code snippet onto your HTML file. It works. Actually, Snap is a search site, that lets people preview search results without open links. It also offers a software for IE browser.